If you are wondering whether to catch this film which has so many mixed reviews, here’s a quick read before you make your decision. I would say, if you are not a DC Comic fan, or if you haven’t been following the previous films (say Man of Steel), it will be advisable to read this so that you won’t end up yawning and missing up the details like I did, or even having to watch the draggy film a second time. So yes, there will be some spoilers, but definitely necessary ones to make you appreciate the film a little more. I never thought I would have to say this, but yes, the Superman/Clark Kent and Lois Lane are the same people (Henry Cavill and Amy Adams) from Man of Steel. And Clark Kent wear glasses, so the guy who wasn’t wearing (see image below) is Bruce Wayne. Why did I make such a silly statement? Because my friend actually mixed up them up, yes, a guy. Yes, I rolled my eyes and did a face palm. Besides a short (but beautifully executed) backstory of young Bruce Wayne’s traumatic childhood, the film started from the climax scene from “Man of Steel” with more focus on the civilians’ injuries, hence the reason for Batman’s hatred for Superman. One thing I’m glad about, the underused Wonder woman managed to create an impact with her limited presence. With Jeremy Irons as Alfred Pennyworth, Bruce Wayne’s butler, and trusted confidant, this older-version-of-Robert-Downey-Junior-lookalike distracted me more than anything else. I was disappointed to see this more of a Batman-centric film than a Batman v Superman film. I don’t read the comics, but the reason for them to fight one another is ridiculous. The reason why the two heroes ended up being friends was even more ridiculous. I won’t spoil it by mentioning too much, but watch it if you must. And remember to shake your head in disbelief when you reached that point. Is that Lex Luther? I thought he’s a bald! With no mention of his name for the longest time, the audience have to guess who on earth this quirky guy was until he self-introduced himself. Luther (Jessie Eisenberg) had some nice lines or speeches but the psychotic character gets weirder as the film go. You will be amazed by how he could easily make the two supposedly-smart Superheroes fight against themselves. While I like Henry Cavill’s Clark Kent, his screen presence was overwhelmed and overpowered by the deadly dark knight and psychotic “joker-like” antagonist. This film, if extended, would most probably make a great Netflix series, but as a film, it was un-engaging (at least until the climax) and not as comprehensive. Now, more than ever, I’m looking forward to Captain America: The Civil War (#TeamCap here). Ben Affleck and Christian Bale met quite by accident in a costume shop while buying a Batman costume for their kids. He asked Bale for advice on playing Batman. Bale told him to “make sure you can piss in that suit.” And for the role, Ben Affleck began working out two hours a day the very next day after he was cast as Batman, gaining an additional 20lbs of muscle and reached 8% body fat in the end. A rough cut of the film was shown for the executives at Warner Bros. They were reportedly so impressed that they not only gave the film a standing ovation, but also began negotiating a deal with Ben Affleck to have him make three solo Batman movies, rather than the original plan to make only one. Ben Affleck will portray Batman in this film, Suicide Squad (2016), The Justice League Part One (2017), Untitled Batman Reboot, Justice League Part Two (2019), and possibly 2 sequels to the Untitled Batman Reboot. This film marks the third time that the role of Batman has been played by an Oscar-winner (Ben Affleck won best Original Screenplay for Good Will Hunting (1997) and Best Picture for Argo (2012). Christian Bale won an Oscar for Best Supporting Actor in The Fighter (2010). George Clooney won for Best Supporting Actor in “Syriana”, as well as Best Picture for “Argo” along with Affleck. And the second time that an Oscar winner has played his butler, Alfred, Jeremy Irons won Best Actor for playing Claus von Bülow in Reversal of Fortune (1990)) and Michael Caine won two Best Supporting Actors in “The Cider House Rules” & “Hannah & her Sisters”. Ben Affleck is 18 months older than Christian Bale, marking the first time the actor taking on the role of Batman/Bruce Wayne is older than the actor who last played the role in a live action movie. All other Batman roles the actor succeeding the role has been younger than the actor who previously played the character. Val Kilmer took the role from Michael Keaton and he is 8 years younger. George Clooney, who is 18 months younger, took the role from Kilmer. Bale is 13 years younger than Clooney. Henry Cavill put on twice the amount of muscle mass for this film than he did for Man of Steel (2013). His trainer said that it was possible because Cavill had kept up a lot of his Superman fitness regiment in the break between the two films, so they were able to build on that foundation and achieve an even bigger body this time around. At his absolute peak during the process of training for the film and filming it, Henry Cavill reached a size of 100 kilos. He however, did not keep at that size for the entire duration of the shoot or the training. When Gal Gadot was asked by a reporter about how she would get Wonder Woman’s breasts from the comics, she answered: “Wonder Woman is amazonian, and historically accurate Amazonian women actually had only one breast. So, if I’d really go ‘by the book’…it’d be problematic.” Gadot practiced Kung Fu, kick boxing, sword fight, jiu-jitsu and capoeira as part of her physical preparation for the role. The glasses Henry Cavill wears as Clark Kent are made by British spectacle designer Tom Davies. Apparently the costume designer found most glasses sat too high on Henry Cavill’s face because he has a high bridge. They sought out Tom Davies, who makes bespoke glasses, to design a one-off pair of spectacles for the job. Jeffrey Dean Morgan was considered for the role of Bruce Wayne/Batman. He was subsequently given the role of Thomas Wayne, Bruce Wayne’s father. This is the first theatrical film to include Barry Allen/The Flash, Arthur Curry/Aquaman & Victor Stone/Cyborg. Michael Cassidy, who plays Jimmy Olsen, the photographer who was a CIA spy in Africa with Lois Lane, also appeared in seven episodes of Smallville (2001), a young Superman series as Sam. The ‘v’ in the title is an abbreviation of the Latin word ‘versus,’ meaning ‘against.’ The title of the film is styled the way court cases are titled. The first party is the claimant (Batman), and he is taking action because he has grievances with the second party, the defendant (Superman). Perry White says “It’s not 1938 anymore” while talking to Clark Kent about people not reading newspapers anymore. Superman was created in 1938. Lex Luthor’s role in this film is based on his appearance in the comic “All-Star Superman”, where he is contemptuous of Superman due to his alien nature. 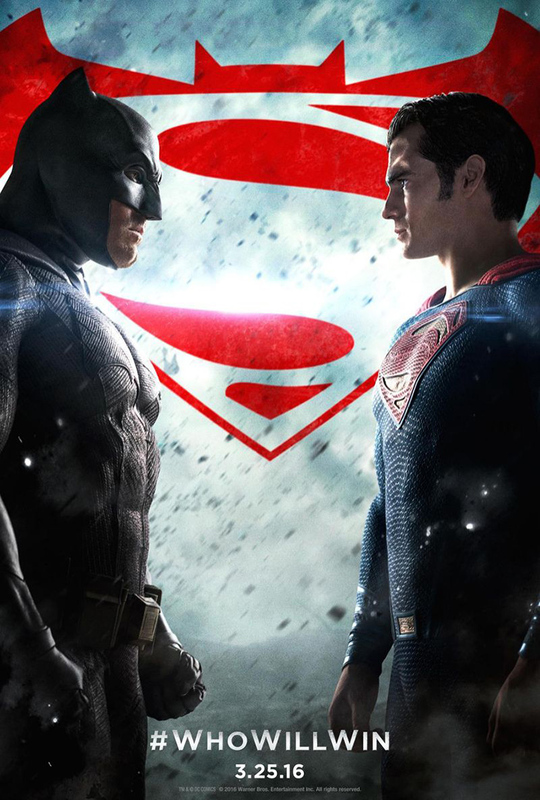 Check out Batman v Superman: Dawn of Justice official website and Facebook Page! Batman v Superman: Dawn of Justice is out in cinemas on 24 March 2016. I don’t think I’m even liking the concept. Why would they want to kill each other???!!!!! I didn’t like this movie much! Had quite high expectations but the movie is not exciting enough for me. Hope to see next few parts picking up well. I just watched the movie last night and I think we share the same opinion. It’s generally nice, but I think they tried too hard to make it Batman centric, turning Lex Luthor into another Joker. I haven’t watched the movie yet though just went for the media launch of it and still planning to watch it with my son. i was actually sleepy halfway of the movie… The only thing that kick my nerve was during the appearance of Wonder Woman. Maybe i got tired of the old figures and same stories. I needed something new. It’s a cool movie, and I wouldn’t mind watching it. It’s definitely a lot more serious than what we’re used to which is basically all the Marvel movies ever made. I would say DC is a bit more on the darker side, I guess what they failed to do was to consider those who aren’t familiar with the story. I have heard only great things about this movie and I am looking forward to seeing it. Gotta love a good action hero movie. The movie could be better with a balance of action and storyline. Overall its moderate for me compared to the hype they created. I still prefer Christian Bale as Batman. I guess when it comes to movies like this you just have to be a fan and appreciate the movie. I am just going to publish my own review of this. Agree that this is more of a Batman than a Superman film. Agree that there are very poor motivations among the the two characters, but I think it was Superman who had the weaker reason. Haven’t seen the movie, not really looking forward to watching at the cinemas, but my husband wants to see it badly! I feel the hype generated for this movie overshadowed the quality of the story. Less impressed by the movie tho! I went to see this on opening day and was so disappointed. I don’t think that I’ll go an see any others. Would have much preferred to see Christian Bale instead of Ben. I have many friends on Facebook who did not find the movie very appealing. This is not reason for me not to watch it though. As you said it may be engaging as people get curious as to how these two characters will complement each other in one same film. I still don’t understand why Batman wants to kill Superman. And why Batman stops after finding out both their mothers have the same name. Just doesn’t make sense to me. Nope. Hahaha… just a reason for them to fight and kill one another! It’s actually deeper than that. with the power that he has, Superman represents the possible extinction of the human race should he turn evil (like in Batman’s visions), so Batman takes it upon himself to see to it that this threat to humanity is eliminated. second, the name thing is a mere coincidence that dates back to the origin of the characters in the 30’s and 40’s. the meaning of the scene is Batman realising the level of Superman’s humanity, even as he is about to be killed all he wants is for Martha Kent (another human being) to be saved from death.